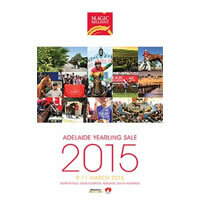 A quality packed catalogue for the 2015 Magic Millions Adelaide Yearling Sale is now online. Comprising 443 lots, the sale has brought together a quality line up of potential racetrack stars from an auction renowned for the vast variety on offer and top quality success. Record entries were received for the sale with several new leading interstate vendors to sell in Adelaide for the first time. The 2015 sale will be held over three days – March 9th to 11th – commencing on Monday the 9th in the evening following the running of the Adelaide Cup and Magic Millions Adelaide 2YO Classic at the adjacent Morphettville Racecourse. This year’s catalogue includes half, three quarter or full relations to quality stakes winners including Arlingtonboulevard, Catapulted, French Bid, Second Effort, Heaven’s Riches, That’s Not It, Arinos, Dashitude, Fasline, Inner Warrior, Victory Chant and dozens more. Stakes winning mares Danglissa, Rain Dance Lady, Umaline, Hinting, La Rieuse, Miss Pavlova, Molta, Northern Song, Stylish Lass, Chelsey’s Image, Cybercyn, Flawed Logic, Minge Cove, Pipkin, Riona, She’s Academic, Tequila Knowledge and Treadmill all have progeny in the catalogue. There are yearlings by no fewer than 126 individual sires represented including the likes of Fastnet Rock, More Than Ready, Encosta de Lago, I Am Invincible, Hussonet, Lonhro, Not a Single Doubt, Sebring, Bel Esprit and Stratum and exciting young prospects So You Think, Foxwedge, Toorak Toff, Smart Missile, Master of Design and the red hot Beneteau. The Adelaide Yearling Sale has a proud history of producing high quality gallopers at affordable prices and was the only auction in the world to provide multiple Group One winners over the recent Melbourne Cup Carnival with Happy Trails ($11,000 purchase) and Hucklebuck ($50,000) taking centre stages. All yearlings offered in Adelaide will be eligible for the Magic Millions Race Series now annually worth $11.19 million after Friday’s groundbreaking $10 million raceday announcement. The catalogue is also available for download via the Equineline Catalog App for iPad.